my darling pencil skirt: Safari can be glamorous, yeeeeeeeee! 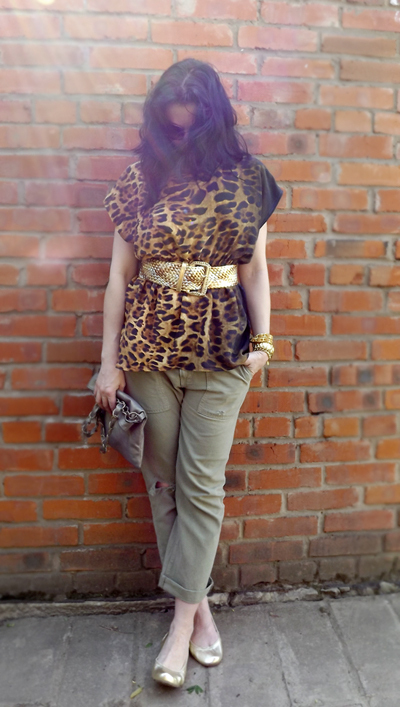 DIY panter-crock ombre open back silk top ( its no pattern and VERY simple, but even a bag of potatoes will look luxury in Cavalli fabric), Current/Elliott army pants, thrift finded 3 tone metallik belt, DIY metallik leather purse, Corso Como gold leather Ballasox ( I heart them , they joy of my feet! ),and my usual arm party.